Portable: the good must be easy to transport and store, making it possible to secure it against loss or theft and allowing it to facilitate long-distance trade. A cow is thus less ideal than a gold bracelet. Fungible: one specimen of the good should be interchangeable with another of equal quantity. Without fungibility, the coincidence of wants problem remains unsolved. Thus gold is better than diamonds, which are irregular in shape and quality. Verifiable: the good must be easy to quickly identify and verify as authentic. Easy verification increases the confidence of its recipient in trade and increases the likelihood a trade will be consummated. Divisible: the good must be easy to subdivide. While this attribute was less important in early societies where trade was infrequent, it became more important as trade flourished and the quantities exchanged became smaller and more precise. Scarce: As Nick Szabo termed it, a monetary good must have “unforgeable costliness”. In other words, the good must not be abundant or easy to either obtain or produce in quantity. Scarcity is perhaps the most important attribute of a store of value as it taps into the innate human desire to collect that which is rare. It is the source of the original value of the store of value. Established history: the longer the good is perceived to have been valuable by society, the greater its appeal as a store of value. A long-established store of value will be hard to displace by a new upstart except by force of conquest or if the arriviste is endowed with a significant advantage among the other attributes listed above. Censorship-resistant: a new attribute, which has become increasingly important in our modern, digital society with pervasive surveillance, is censorship-resistance. That is, how difficult is it for an external party such as a corporation or state to prevent the owner of the good from keeping and using it. 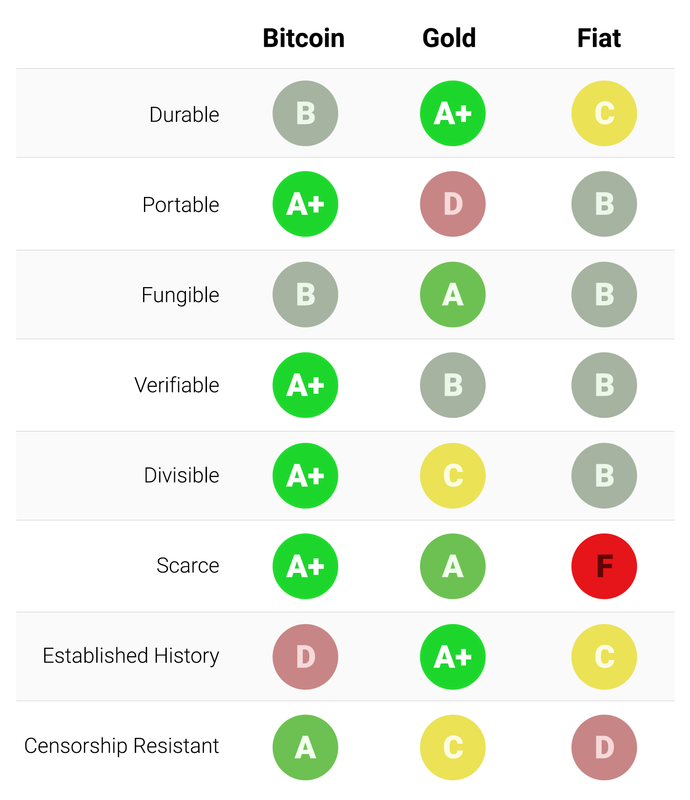 Goods that are censorship-resistant are ideal to those living under regimes that are trying to enforce capital controls or to outlaw various forms of peaceful trade. Gold is the undisputed King of durability. The vast majority of gold that has ever been mined or minted, including the gold of the Pharaohs, remains extant today and will likely be available a thousand years hence. Gold coins that were used as money in antiquity still maintain significant value today. Fiat currency and bitcoins are fundamentally digital records that may take physical form (such as paper bills). Thus it is not their physical manifestation whose durability should be considered (since a tattered dollar bill may be exchanged for a new one), but the durability of the institution that issues them. In the case of fiat currencies, many governments have come and gone over the centuries, and their currencies disappeared with them. The Papiermark, Rentenmark and Reichsmark of the Weimar Republic no longer have value because the institution that issued them no longer exists. If history is a guide, it would be folly to consider fiat currencies durable in the long term — the US dollar and British Pound are relative anomalies in this regard. Bitcoins, having no issuing authority, may be considered durable so long as the network that secures them remains in place. Given that Bitcoin is still in its infancy, it is too early to draw strong conclusions about its durability. However, there are encouraging signs that, despite prominent instances of nation-states attempting to regulate Bitcoin and years of attacks by hackers, the network has continued to function, displaying a remarkable degree of “anti-fragility”. Bitcoins are the most portable store of value ever used by man. Private keys representing hundreds of millions of dollars can be stored on a tiny USB drive and easily carried anywhere. Furthermore, equally valuable sums can be transmitted between people on opposite ends of the earth near instantly. Fiat currencies, being fundamentally digital are also highly portable. However, government regulations and capital controls mean that large transfers of value usually take days or may not be possible at all. Cash can be used to avoid capital controls, but then the risk of storage and cost of transportation become significant. Gold, being physical in form and incredibly dense, is by far the least portable. It is no wonder that the majority of bullion is never transported. When bullion is transferred between a buyer and a seller it is typically only the title to the gold that is transferred, not the physical bullion itself. Transmitting physical gold across large distances is costly, risky and time-consuming. Gold provides the standard for fungibility. When melted down, an ounce of gold is essentially indistinguishable from any other ounce, and gold has always traded this way on the market. Fiat currencies, on the other hand, are only as fungible as the issuing institutions allow them to be. While it may be the case that a fiat banknote is usually treated like any other by merchants accepting them, there are instances where large-denomination notes have been treated differently to small ones. For instance, India’s government, in an attempt to stamp out India’s untaxed gray market, completely demonetized their 500 and 1000 rupee banknotes. The demonetization caused 500 and 1000 rupee notes to trade at a discount to their face value, making them no longer truly fungible with their lower denomination sibling notes. Bitcoins are fungible at the network level, meaning that every bitcoin, when transmitted, is treated the same on the Bitcoin network. However, because bitcoins are traceable on the blockchain, a particular bitcoin may become tainted by its use in illicit trade and merchants or exchanges may be compelled not to accept such tainted bitcoins. Without improvements to the privacy and anonymity of Bitcoin’s network protocol, bitcoins cannot be considered as fungible as gold. For most intents and purposes, both fiat currencies and gold are fairly easy to verify for authenticity. However, despite providing features on their banknotes to prevent counterfeiting, nation-states and their citizens still face the potential to be duped by counterfeit bills. Gold is also not immune from being counterfeited. Sophisticated criminals have used gold-plated tungsten as a way of fooling gold investors into paying for false gold. Bitcoins, on the other hand, can be verified with mathematical certainty. Using cryptographic signatures, the owner of a bitcoin can publicly prove she owns the bitcoins she says she does. Bitcoins can be divided down to a hundred millionth of a bitcoin and transmitted at such infinitesimal amounts (network fees can, however, make transmission of tiny amounts uneconomic). Fiat currencies are typically divisible down to pocket change, which has little purchasing power, making fiat divisible enough in practice. Gold, while physically divisible, becomes difficult to use when divided into small enough quantities that it could be useful for lower-value day-to-day trade. The attribute that most clearly distinguishes Bitcoin from fiat currencies and gold is its predetermined scarcity. By design, at most 21 million bitcoins can ever be created. This gives the owner of bitcoins a known percentage of the total possible supply. For instance, an owner of 10 bitcoins would know that at most 2.1 million people on earth (less than 0.03% of the world’s population) could ever have as many bitcoins as they had. Gold, while remaining quite scarce through history, is not immune to increases in supply. If it were ever the case that a new method of mining or acquiring gold became economic, the supply of gold could rise dramatically (examples include sea-floor or asteroid mining). Finally, fiat currencies, while only a relatively recent invention of history, have proven to be prone to constant increases in supply. Nations-states have shown a persistent proclivity to inflate their money supply to solve short-term political problems. The inflationary tendencies of governments across the world leave the owner of a fiat currency with the likelihood that their savings will diminish in value over time. One of the most significant sources of early demand for bitcoins was their use in the illicit drug trade. Many subsequently surmised, mistakenly, that the primary demand for bitcoins was due to their ostensible anonymity. Bitcoin, however, is far from an anonymous currency; every transaction transmitted on the Bitcoin network is forever recorded on a public blockchain. The historical record of transactions allows for later forensic analysis to identify the source of a flow of funds. It was such an analysis that led to the apprehending of a perpetrator of the infamous MtGox heist. While it is true that a sufficiently careful and diligent person can conceal their identity when using Bitcoin, this is not why Bitcoin was so popular for trading drugs. The key attribute that makes Bitcoin valuable for proscribed activities is that it is “permissionless” at the network level. When bitcoins are transmitted on the Bitcoin network, there is no human intervention deciding whether the transaction should be allowed. As a distributed peer-to-peer network, Bitcoin is, by its very nature, designed to be censorship-resistant. This is in stark contrast to the fiat banking system, where states regulate banks and the other gatekeepers of money transmission to report and prevent outlawed uses of monetary goods. A classic example of regulated money transmission is capital controls. A wealthy millionaire, for instance, may find it very hard to transfer their wealth to a new domicile if they wish to flee an oppressive regime. Although gold is not issued by states, its physical nature makes it difficult to transmit at distance, making it far more susceptible to state regulation than Bitcoin. India’s Gold Control Act is an example of such regulation. Bitcoin excels across the majority of attributes listed above, allowing it to outcompete modern and ancient monetary goods at the margin and providing a strong incentive for its increasing adoption. In particular, the potent combination of censorship resistance and absolute scarcity has been a powerful motivator for wealthy investors to allocate a portion of their wealth to the nascent asset class. Part 3 of this article will be published tomorrow and linked from Twitter (follow me). 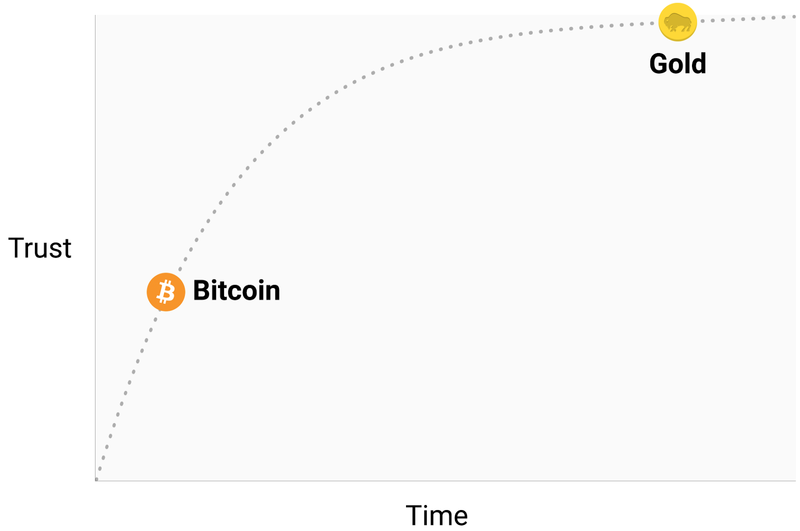 In part 3, I will cover the evolution of money, how a monetary good transitions from a store of value to a medium of exchange and where Bitcoin is in its evolution to a fully fledged global money. Español by Carlos Beltrán with editing by Iñigo.